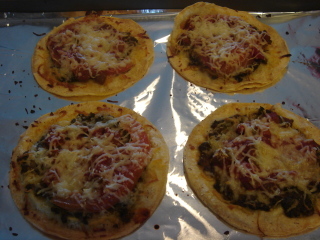 Since we’re on a health kick, I whipped up these satisfying personal pizzas for lunch one afternoon. 2. Toast the corn tortillas for 3 minutes on each side in a non-stick skillet with no spray/butter. Make sure they’re not too crunchy. 4. 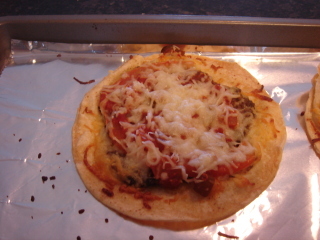 Layer the ingredients in this order: Pesto, slice of tomato, 1 tbsp of salsa, and sprinkle half the cheese on top. 5. Place the baking sheet with tortillas in the oven and bake for 5-8mins or until it’s melted to your liking. If you happen to have any leftover pesto, you can spread it on top of the warm cheese.